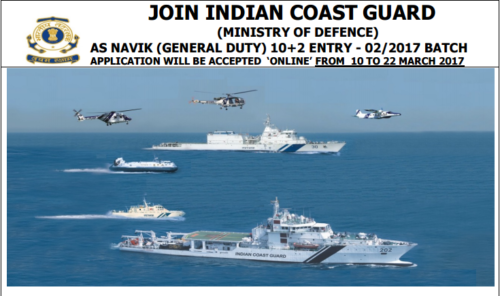 Indian Coast Guard has released a notification for the recruitment of Navik (General Duty). Interested candidates may check the vacancy details and apply online from 24-12-2017 to 02-01-2018. Educational Qualification: Candidates should have passed 10+2 with 50% marks aggregate in total and minimum 50% aggregate in Maths and Physics from an education board recognised by Central/State Government. Selection of candidates will be made on the basis of Short-listing based on Higher Percentage, Written Test and Physical Fitness Test (PFT). 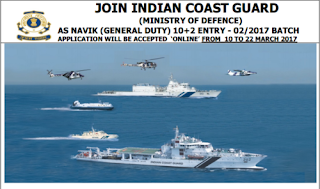 Interested and eligible candidates may apply online through Indian Coast Guard website - http://www.joinindiancoastguard.gov.in/ - from 24-12-2017 to 02-01-2018.